The 10-times TT winner will renew links with TEAM MIRAI when he spearheads their entry in the SES TT Zero race on Wednesday, June 6th. Lougher last rode for the Japanese outfit in 2013. In extremely difficult circumstances, he took over the reigns of the Komatti-Mirai bike from his good friend Yoshinari Matsushita who tragically lost his life in a practice crash at Ballacrye. The company C/O Mr. Yoshihiro Kishimoto decided to try the TT again in 2018 with his new EV bike which brings to the table a very small machine, but with aggressive power using a NSF250 chassis. Mr. Kishimoto himself competed in Pikes Peak in the USA, and he also competed at the Cemetery circuit in New Zealand among engine machines in 2017 finishing with two very respectable 5th and 6th places. It will again be a busy fortnight for Lougher as he will oversee the challenge of the team's young gun Joey Thompson who will be competing in his second TT races. "I'm quite intrigued and looking forward to riding Kishimoto san’s electric bike at the TT again, although this bike is a totally new machine from 2013. I was lucky to be able to test the machine while I was in Japan recently, it was not an ideal test as it was only one degree above freezing but it was still good to get a general feel of it. It’s very small as it’s based around a Moto 3 Honda chassis, which is great for me as I have plenty of experience riding one of those, so I’ll get tucked in and see how we get on." "I am extremely pleased that my team is planning to come back to TT Zero for the first time in five years. At our last participation in TT Zero in 2013 during our final preparation for the machine "TT Zero 13", we heard the news of Yoshinari Matsushita's accident while we were in London. Our team had to face the heaviest difficult decision after our rider died during practice for the Isle of Man TT. But Ian Lougher who was a close friend of Yoshinari decided to ride for him and he finished the race well. This year, I am very proud that Ian and our team can come together again for the TT Zero race. Of course, Yoshinari will also participate together in our minds. We are just a small independent team from Japan, please support us and our rider Ian Lougher. 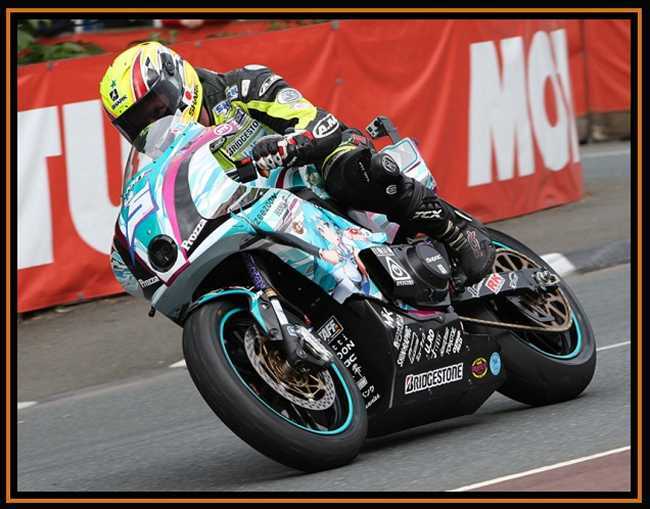 Ian Lougher exits Quarter Bridge on the Komatti-Mirai Racing bike during TT Zero 2013.